If industry pundits are right ― http://www.musicweek.com/news/read/radio-1-music-boss-guitar-music-is-coming-back/052585 ― and guitar music is to return centrestage in indiedom, thinking beyond, jazz guitar may follow suit. The signs are there, but how will it build? It could go retro in the hands of someone like Hannes Riepler who draws in a crowd of young players to his Tuesday Charlie Wright’s jams in Shoreditch. Or more contemporary, stimulated by a charismatic player such as Dan Messore who has started a series of Sunday gigs at the Vortex and whose band Indigo Kid joins the dots between the Iain Ballamy school of improvisers and new players such as BBC New Generation artist saxophonist Trish Clowes. More likely, though, given the big interest in bands such as Supersilent who have been touring with John Paul Jones and play tonight at London venue the Village Underground, is the electronica side to guitar music. There’s no finer an exemplar of this strand than Eivind Aarset whose new album Dream Logic has just been released by ECM. 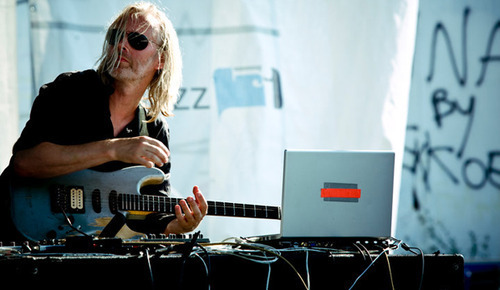 It’s a duo record featuring the 51-year-old guitarist with sampler Jan Bang, whose festival Punkt this year saw live performance by ambient pioneer Brian Eno. The world where guitar synths and keyboards combine is the battleground of innovation, and other bands such as Eyes of a Blue Dog with trumpeter Rory Simmons switching to guitar and live sampling by drummer Terje Evensen coalescing with vocals to chart new territory and add to the interplay. For nearly a decade and a half since Electronique Noire and with the Sonic Codex Orchestra Aarset has continued his pioneering work that makes each of his albums seem like a statement and stand out from the crowd. Glacially slow and lingering Dream Logic’s 11 tracks are mostly the work of Bang and Aarset although producer Erik Honoré who recorded and mixed much of the album is co-credited on ‘Surrender’, and ‘The Beauty of Decay’. With Aarset think the late Pete Cosey, think music from south east Asia, delivered at times by a Boss digital delay pedal, and you’re half way there with Aarset who in his youth was influenced by Jimi Hendrix, Miles Davis and Terje Rypdal. That trinity is interesting but a Venn diagram of all three does allow for the starting point that for those interested in finding Rypdal via Aarset, like say Finnish band Oddarrang, there is huge transformation possible in the air. If jazz guitar does move centrestage it will be different with input from electronica. Retro currents can drive change, ironically, and if you’re heard the until 2012 unreleased archive album Echoes of Indiana Avenue by Wes Montgomery you’ll understand what I mean, but it’s the new generation that given the possibilities technology allows has the potential to revolutionise the music to reflect the present. It’s the journey towards a sound in jazz no one has ever heard. Aarset is, it’s clear, an innovator of some clout, as Dream Logic his finest work to date clearly indicates. The most significant jazz album to come out of Norway since Khmer in the late-1990s.